A plaque commemorates the Royal Australian Air Force (R.A.A.F.) Chemical Warfare Armourers who served in World War Two. On 6 January 1942 the Air Board approved the RAAF’s acquisition of the disused 660-metre-long railway tunnel at Glenbrook for the storage of bombs, a move that occurred on 4 April 1942. A variety of ammunition types, including chemical ammunition, was stored at this site over the years. The chemical weapons consisted mainly of bulk drums of mustard gas (50/90 gallon and Chemical Special No. 6), but also included 65 lb bombs. The Royal Australian Air Force realised they would need a specialist unit to handle the chemical weapons. A specialist group of armourers was raised, they were responsible for the unloading, transportation, maintenance and disposal of chemical warfare stocks during and after the war. 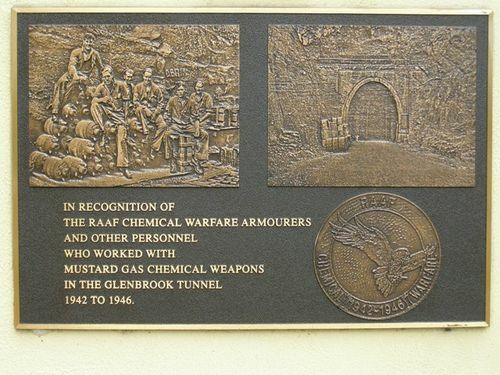 Known as the Mustard Gas Men, the armourers handled the one million chemical weapons that were imported into Australia from the United Kingdom and the United States between 1942 and 1946. The weapons were vital to the defence of Australia. Intelligence had reported that as the Japanese swept down through South East Asia, they carried a range of chemical weapons and during their invasion of Manchuria in China they had shown a willingness to use them. The Federal Government provided a $4,000 grant to the Glenbrook R.S.L. for the plaque as part of the "Saluting Their Service" program administered by the Department of Veterans’ Affairs. The dedication speech was undertaken by the Federal Member for Lindsay, David Bradbury.